Mahjong, a Chinese game of cunning, strategy and chance that is played around the word, typically requires four players. A variation of mahjong, however, allows three players to compete in the game. The three-player mahjong game requires reducing the number of tiles and dice in play. Three-player mahjong is considered a Japanese variation of the game and is sometimes called Japanese mahjong. It can be played as a gambling game or just for fun. Remove the simple tiles -- also called the middle tiles -- of the character suit. The middle tiles are those numbered 2 through 8. This leaves only the tiles of the character suit valued at 1 and 9. Removing them leaves the number of tiles in three-player mahjong at 108. Four-player mahjong uses 144 or 152 tiles, depending on the variation. Remove all but one of the dice used in standard, four-player mahjong. This leaves one die for use in three-player mahjong. Traditional four-player mahjong employs three or four dice, depending on the variation of the game. 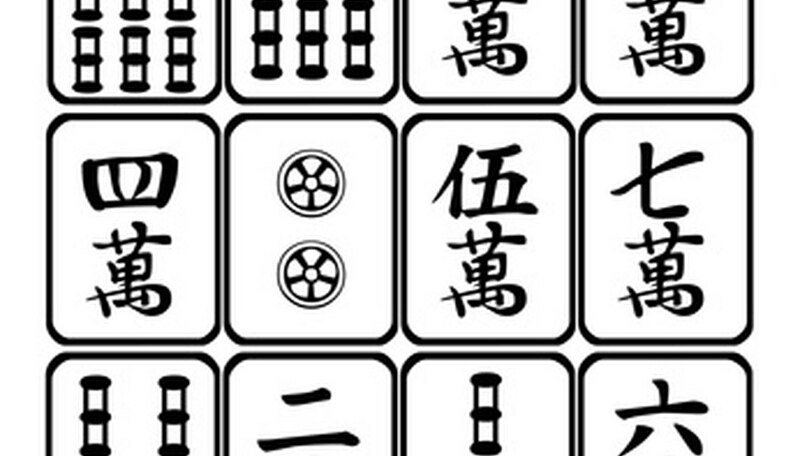 Disallow the chi, or chow, a move that is permitted in four-player mahjong. That means in three-player mahjong a player cannot complete a run of three tiles by claiming a tile from the person to his left. Allocate the seats by placing the East, South and West wind tiles face down, shuffling them and having each player choose one tile. The player who drew East selects a seat and sits down. The player who drew South sits to his right. The player who drew West sits across from the East seat. Place the 108 tiles face down and shuffle them thoroughly. Each player then builds a wall 18 tiles long and two tiles deep. Establish the initial "Oya," or senior player, after the walls have been built. Have the player in the East seat roll the die and count the result counterclockwise around the table, starting with himself. The player selected rolls the die and repeats the process. The player he selects becomes the Oya. The round of play continues until each player has had a turn as the Oya. Have the Oya roll the die again and count counterclockwise to determine which wall of tiles will be broken and where in the wall the break will be made. Using the roll number and the breaks in the wall as guidelines, the Oya and the two other players remove tiles from the wall so that the wall recedes clockwise. The process continues until the Oya has 14 tiles and the other two players each have 13. Continue playing as in traditional four-player mahjong, with players attempting to form winning hands before their opponents, collect as many points as possible and record the highest score after a specific number of rounds.